How to find files inside ZIP files or emails - Datamaton Inc. Sometimes, important photos, documents etc. lie hidden inside “compound” ZIP files (or 7z, ISO or gzip files). Often, we don’t even know that a file we’re looking for is embedded inside something else! For example, when we download multiple files from Google Drive, we get a single ZIP file. Files aren’t the only “compound” types – emails can also contain embedded attachments. Older files and photos are especially likely to have been emailed around rather than shared via cloud storage providers. We often remember something about the file we’re looking for but nothing about the compound file/email which contains it. Since we can’t directly search using the embedded file’s properties, we struggle to find it. For example, many of my kids’ photos are in emails I’ve forwarded multiple times from one account to another. How can I find them if I don’t remember the email subjects or dates? So how can you find a file that is embedded inside another file or email? With Blob, you find it just like any “normal” non-embedded file! You don’t need to remember whether the file you’re looking for is embedded inside something else or not. Blob indexes embedded and compound content just like any regular non-embedded content. Thus, to find my kids’ photos, I can search based on camera make/model or a range of dates. 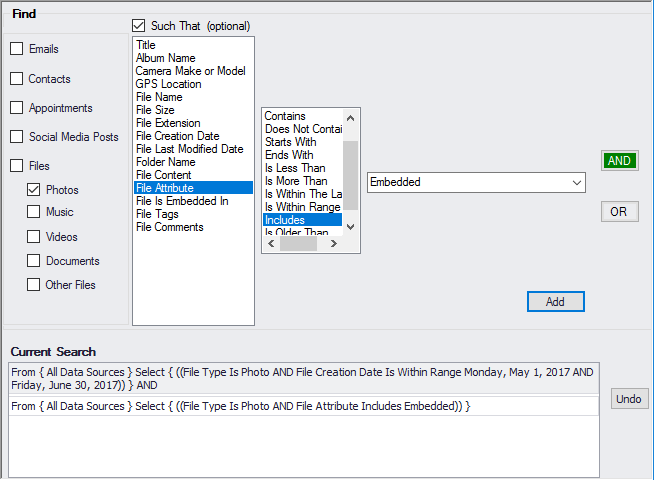 Blob will automatically report photos inside ZIP files or emails that match my search criteria. I don’t need to remember the date, name or subject of the compound ZIP file/email within which they reside. If you know the file you are looking for is embedded, you can explicitly tell Blob to only search embedded files. You do that by specifying the “Attribute Includes Embedded” search condition as shown below. This searches reports photos that were taken between May 1, 2017 and June 30, 2017 and that are embedded inside something else. This is useful if issuing a search just based on the date range would return too much content.